The scaffold to this Government building facades created a number of technical issues that needed to be addressed, not the least of which was the inability to physically tie the scaffold to the external facades whilst at the same time spanning over the entrance. 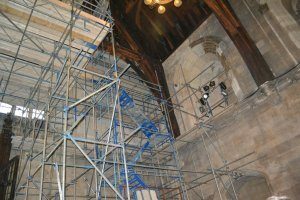 After much discussion a scaffold was designed to alleviate this problem using a number of high tension beam units, a double width scaffold and a tying system involving a box beam to the parapet. The building is a highly treasured icon and as such extra care needed to be taken at all stages to ensure that there was no damage incurred on the facade. To access the area of work with the plant also presented a potential problem so a dedicated walkway was created from our vehicle to the place of work. This walkway was made from a combination of ply, correx and polythene. Throughout the duration of the works the building was in constant use and therefore operatives had to be mindful of the effects of their actions upon the general public. This involved creating exclusion zones, sign posting and the use of banksmen.